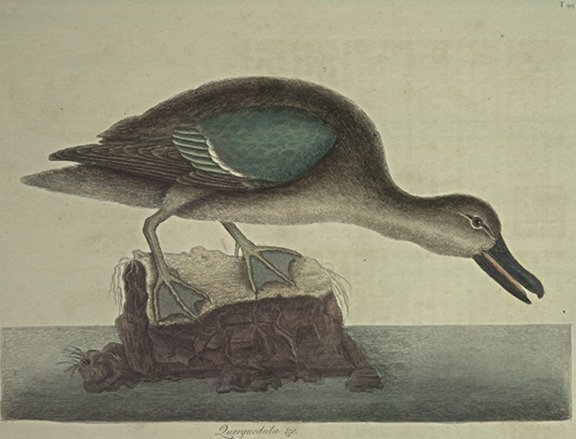 Is somewhat bigger than the common Teal, the Bill black; the Head, and most part of the Body of a mixt gray, like that of a Wild Duck, the Back being darker than the under part of the Body; the upper part of the Wing is of a bright blue, below which ranges a narrow Row of white Feathers; next to them a Row of green; the rest of the Wing, being the Quill-feathers, is dark brown, the Legs and Feet, brown. The Female is all brown, like a common Wild Duck. In August these Birds come in great plenty to Carolina, and continue till the middle of October, at which time the Rice is gather'd in, on which they feed. In Virginia, where no Rice grows, they feed on a kind of Wild Oate growing in the Marshes, and in both places they become extreamly fat. They are not only by the Natives preferred to all other Water-fowl, but others, who have eat of them, give them the preference to all of the Duck kind for delicacy of taste.